I always say that I don't like falsetto voices in music - and then I have to amend and add that I really like Lou Christie and Frankie Valli. 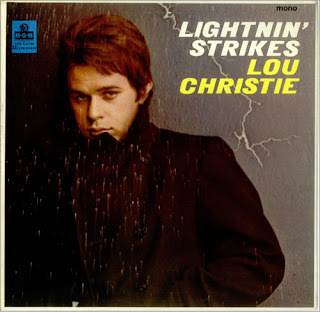 "Lightnin' Strikes" was a number one hit in 1966, and was written by Lou Christie and Twyla Herbert. Lou Christie was born Lugee Alfredo Giovanni Sacco in 1943 and grew up in Pittsburgh, Pennsylvania. He was an aspiring recording artist since his teens, and had his first hit in 1962 ("The Gypsy Cried"). I remember this song from AM radio when I was a very little girl. I loved it then and still do. The recording is below, for your listening pleasure. I love this song, and haven't heard it in ages! The falsetto part reminds me of the Bee Gees, who I also love.